DID JESUS DIE ON A STAKE? What is the difference of a CROSS and a STAKE or POLE? Well most Christians as well as most people in the “world” understand that a CROSS is made by TWO pieces of wood being fastened together is some way to form an “X”, a “T”,or a shape like the lower case “t” where the cross member is not all the way to the top of the vertical post, pole, stake or pale. Again most Christians believe that Jesus died on a CROSS where the beam of wood crossed over and upright beam of wood part way down from the top of the upright beam of wood to look somewhat like the lower case “t”,as opposed to a capital “T” or an “X” shaped cross. This would then leave room for the sign nailed above the head of Jesus saying this is the King of the Jews, whereas neither the “X” shaped cross, nor the “T” shaped cross would allow for the sign above the head of Jesus as the Bible clearly states. But recently it came to my attention that some Christians FIRMLY believe that it is wrong and even possibly a sin for a Christian to believe that Jesus died on a CROSS and therefore they teach that a Christian must believe that Jesus died on a STAKE or a POLE fearing that they may not be a Christian at all if they believe that Jesus died on a CROSS. So who is teaching the correct SOUND Biblical teaching? ; Those who insist that Jesus died on a TORTURE STAKE? ; Or those who have maintained the same teaching from the beginning that Jesus died on a CROSS? Let us begin this study in God's word by first taking a look at the arguments presented by the Jehovah's Witnesses who insist that Christians must believe that Jesus died on a STAKE, because God would not have allowed his Son to die on a PAGAN symbol of the CROSS and then we will take a look at what the Bible itself has to say. "There are also inanimate objects that if venerated may lead to breaking God's commandments. Among the most prominent is the cross. For centuries it has been used by people in Christendom as part of their worship. Soon God will execute his judgments against all false religions. Those who cling to them will suffer their fate." Watchtower 1989 May 1 p.23. So here we can clearly see that the Jehovah's Witness believe and teach that any Christian church that uses the symbol of the CROSS is a FALSE religion and that they shall suffer their fate. Let us now take a look at an article that was written by a Jehovah's Witness. Again the emphasis is mine. “Many view the cross as the most common symbol of Christianity. However, the Bible does not describe the instrument of Jesus’ death, so no one can know its SHAPE with absolute certainty. Still, the Bible provides evidence that Jesus died, NOT on a cross, but on an upright stake. Is using the cross in worship acceptable to God? Regardless of the SHAPE of the instrument on which Jesus died, the following facts and Bible verses indicate that we should not use the cross in worship. God rejects worship that uses images or symbols, including the cross. God commanded the Israelites not to use “the form of any symbol” in their worship, and Christians are likewise told to “flee from idolatry.”—(Deuteronomy 4:15-19: 1 Corintians 10:14). First-century Christians did not use the cross in worship. The teachings and example of the apostles set a pattern that all Christians should adhere to.— (2 Thessalonians 2:15). Use of the cross in worship has a pagan origin. Hundreds of years after the death of Jesus, when the churches had deviated from his teachings, new church members “were permitted largely to retain their pagan signs and symbols,” including the cross. (The Expanded Vine’s Expository Dictionary of New Testament Words) However, the Bible does not condone adopting pagan symbols to help make new converts.—(2 Corinthians 6:17). This article written by a Jehovah's Witness opens with a statement of FACT that the Bible itself does NOT come right out and DESCRIBE the instrument on which Jesus was crucified. So therefore the Jehovah's Witnesses conclude that no one can really know with absolute certainty the SHAPE of the instrument that Jesus died upon. Please notice that this Jehovah's Witness goes on to write “Regardless of it's SHAPE....” Which tells me that the Jehovah's Witnesses do not have any undeniable evidence that proves beyond any shadow of a doubt that Jesus died on a SINGLE upright STAKE or POLE without any cross member whatsoever. In other words, this Jehovah's Witness is saying that it does not matter as to the SHAPE of the instrument of the crucifixion, but what matters is that God commands us not to use any symbols or images in our worship. To this truth I agree. The Bible makes it quite clear that we as Christians are not to worship any graven image. I also believe that it does not truly matter if Jesus died on a cross or on a pole. What matters is that Jesus died for our sins and Almighty God the Father raise his Son from the dead. That is the core foundation of our faith. Also I do not believe that any Christian actually WORSHIPS the cross itself by merely having a symbol of the cross in their church. The Roman Catholic church does have a service once a year where Catholics come up and kiss the feet of an image of Jesus on a crucifix, but again I personally do not believe that they are actually worshiping that IMAGE of Jesus in the way that PAGANS worshiped their idols. I could be wrong on this point, but being a Catholic early on in life I myself did not worship any image of Jesus, but rather I knelt down in front of a crucifix and prayed to Jesus up in heaven. There was no hint of any belief in me personally that any statue was actually Jesus personified. But that is ME. I can not say what others do when they kneel before a crucifix. Anyway all that Catholicism teaches is behind me now that I have come to the knowledge of the truth that NO church denomination can save a person. Please read the study “HOW CAN I BE SAVED?” for a deeper understanding of what the word of TRUTH, the Holy Bible teaches of what we must do in order to be saved and receive eternal lie in the world to come. But for no let us get back to the arguments of the Jehovah's Witnesses against Jesus dying on a CROSS. Then this article written by a Jehovah's Witness closes with the CROSS being a PAGAN symbol and that the church adopted or mixed many PAGAN beliefs and practices into Christian worship. So then, the core of this issue in not so much in the SHAPE of the instrument of crucifixion, but rather the SYMBOL of the cross being used in WORSHIP being a PAGAN symbol. Again I personally agree that Christians should not bow down and worship a crucifix by kissing the feet of an IMAGE of Jesus hanging on a cross as Catholics do in the Roman Catholic church. But this is not to say that having a symbol of a bare cross to testify the faith of a Christian that Jesus suffered and died for our sins is against God's word. More on my own personal belief about having a crucifix further on in this study. So then, what we can conclude thus far is that no matter the SHAPE of the emblem of suffering and shame that Jesus was crucified upon the core FOCUS of any Christian should be on the FOUNDATION of our faith that Jesus suffered and died, not only for our sins, but also for the sins of the whole world. This is the heart of the gospel of Jesus Christ. Please read 1 Corinthians 3:1-11, which teaches us that we should not call ourselves by the name of the church DENOMINATION that taught us about Jesus dying for our sins and being raised from the dead. “And I, brethren, could not speak unto you as unto spiritual, but as unto carnal, even as unto babes in Christ. 2. I have fed you with milk, and not with meat: for hitherto you were not able to bear it, (or understands what I desire to teach you) neither yet now are you able. 3. For you are yet carnal: (WHY are these Christians yet carnal?) for whereas there is among you envying, and strife, and divisions, are you not carnal, and walk as men? 8. Now he that plants and he that waters are one: and every man shall receive his own reward according to his own labor. 10. According to the grace of God which is given unto me, as a wise master builder, I have laid the FOUNDATION, and another builds thereon. But let every man take heed how he builds thereupon. Paul went on to say in 1 Corinthians 2:2 that he was determined not to know anything except Jesus Christ and him being CRUCIFIED. So early on in Paul's ministry his gospel message consisted of Jesus being crucified and raised from the dead for the forgiveness of sin. That was the foundation of the gospel of Jesus Christ and all that was needed for men and women to be saved. Please read Romans 10:8-11 where the emphasis is more on the resurrection of Jesus as opposed to the crucifixion of Jesus. But obviously one must believe in the crucifixion of Jesus before they can believe in the resurrection of Jesus. They go hand in hand so to speak. You cannot believe in one without believing in the other. 10. For with the heart man BELIEVES unto righteousness; and with the mouth CONFESSION is made unto salvation. So then, the FOUNDATION of our FAITH is to believe and preach the gospel of Jesus Christ, which is the crucifixion and the resurrection of Jesus teaching people that if they BELIEVE that Jesus died for their sins and that God raised his Son Jesus from the dead then Almighty God will forgive them of all their sins. There is NO mention in the word of God that we must believe that Jesus died on a stake that was WITHOUT ANY CROSS MEMBER whatsoever. Nor does the Bible come straight out and DESCRIBE the SHAPE of the instrument of death upon which Jesus was crucified. So then, going back to the statement made by the Jehovah's Witnesses that since no DESCRIPTION is given in the Bible of the instrument of death upon which Jesus was crucified, then NO MAN can KNOW it's SHAPE. Well the EYEWITNESS surely knew it's SHAPE! More on what these EYEWITNESS had to say about the instrument of death upon which Jesus died a little further on in this study, but for now let us take a look at the Biblical evidence of why the Jehovah's Witnesses insist that Jesus died on a STAKE rather than a cross even though they say that NO man can KNOW it's SHAPE. Sounds like they contradict their own teaching to demand or insist that Jesus did NOT die on a CROSS, but rather he died on a stake and then to turn right around and state that NO man can truly know with absolute certainty of the SHAPE of the instrument of death upon which that Jesus was crucified. With that being said we will now take a look at the Biblical evidence that the Jehovah's Witnesses use to teach that Jesus did not die on the CROSS, but rather Jesus died on a STAKE or a POLE. Let me again quote what a Jehovah's Witness website states. Please keep in mind that all Bible commentaries are OPINIONS of what some believers have concluded to believe and that other equally qualified Bible scholars have OPINIONS that DIFFER from those used by the Jehovah's Witnesses. In other words, these sources used by the Jehovah's Witnesses are NOT the ONLY Bible sources out there. To say this another way NOT ALL Bible concordances agree with these two sources used by the Jehovah's Witnesses to try and prove that the Greek word “stauros” can ONLY mean an upright stake WITHOUT ANY CROSS MEMBERS whatsoever. We will take a look at the meanings of words further on in this study, but for now let us take a closer look at this evidence or the meaning of this Greek word “stauros”. It is true that ONE of the meanings of the Greek word “stauros” does indeed mean stake, pole and pale, but this Greek word ALSO means CROSS according to Strong's expanded concordance, which is a widely accepted authoritative source of the Greek and Hebrew meanings of Biblical words. ALSO MOST ever version or translation of the Bible translates the Greek word “stauros” as CROSS. Even early writings of the Jehovah's witnesses used the word CROSS in their OWN teaching publications as the instrument of death upon which Jesus was crucified. As far as I have been made aware it is ONLY the Christian denomination of the Jehovah's Witnesses that use the translation of STAKE in their writings to teach that Jesus died on a STAKE rather than Jesus dying on a CROSS. Also it should be noted that they ADD the word “TORTURE” to the original text to render the phrase in their own translation of the Bible as Jesus dying on a TORTURE STAKE. As we have already learned the main argument of the Jehovah's Witnesses is that the symbol of the cross is a PAGAN symbol. They make the CLAIM that since the FIRST century church did NOT use the cross, then this PAGAN symbol of the cross was introduced into the church in the third and fourth century beginning with Constantine. Well the truth of the matter is that an “UPRIGHT STAKE” is also a PAGAN symbol called a “PHALLIC”, and one of the most taught against symbols of pagan worship in the Old Testament. There are many verses in the Old Testament where God commands his people Israel to destroy the heathen images of false gods and to cut down there groves, which were wooden POLES set upright in the ground to worship the goddess Ashtoreth or Asherah. It is certainly understandable why God would command idols an objects of worship to false gods to be destroyed, but God himself instructed Moses to make a IMAGE of a serpent and hang it on a POLE. This image or symbol was then used by God to heal any and all of who obeyed his word to LOOK upon the serpent hanging on the pole after they were bitten by a deadly snake. Therefore if God's people believed God and obeyed his word to LOOK upon the serpent hanging on the tree, then they would LIVE and not die. Jesus then used this IMAGE that Moses made at the instruction of Almighty God as scriptures prophesying of the Son of God being LIFTED UP from the earth signifying what death he himself should die being hanged on a tree. The passage of scripture in Galatians of Jesus being made a CURSE for us because cursed is he that is hanged of a TREE teaches us that we pass from death to life by our faith in Jesus being crucified on an object made of wood and then raised from the dead. The word translated as “tree” here in Galatians also means POLE, but carries the meaning of any wooden object. So just as the people of Israel who had a SENTENCE of DEATH in them by being bitten by the deadly SERPENT, who would LOOK to the SYMBOL of the serpent hanging on the POLE, then they would LIVE and not die. If they did not LOOK at the SYMBOL of the serpent hanging of the POLE, then they would die. Again it is NOT the shape of the symbol as being the matter of importance, but rather that Almighty God himself USED symbols to LOOK upon while BELIEVING in God. This is NOT worshiping the symbol, but rather REMEMBERING the things of God to help our minds be stayed on him. When Israel LOOKED upon the SYMBOL of the serpent hanging on the pole it was an act of OBEDIENCE to God and by obeying God they did NOT DIE. So it was DEATH that was nailed to the cross or pole that day that Jesus died for our sins. Therefore the SYMBOL of a CROSS, a bare empty cross, represents to a Christian the death and resurrection of Jesus giving us the promise of ETERNAL LIFE where the second death will have no power over us on the day of judgment. We are taught in the Bible to remember our Lord's DEATH every time we take communion so a BARE cross to me is more of a remembrance or our Lord's RESURRECTION being WITHOUT the body of Jesus still hanging on the cross as a "crucifix". Again more on this subject of a crucifix further on in this study of God's word. where the main focus is to learn if Jesus did indeed die on a CROSS or if the Jehovah's Witnesses are correct in their insisting that Jesus died on a TORTURE STAKE. In truth I myself do not believe that any Christian truly worships a symbol of the cross, but rather they simply use the symbol of the cross to testify their faith in Jesus. Now if they do truly worship an image of the cross, then it certainly is a sin and the words that Jesus taught will be their judge especially if their worship is directed to a FALSE PAGAN god. We can see in the Bible that there were some Pagans who became Christians but still practiced some of their Pagan sacrifices and Paul instructs us that we cannot partake of both the Lord's supper and offering meat to idols. More on this later as well. So then, let us return to one of the Jehovah's Witnesses arguments of Jesus dying on a stake and not a cross. I agree that the wording in the original text seems to point to Jesus being crucified on a POLE or a STAKE, which again is also a PAGAN symbol. And it is indeed true that the wording in the Bible itself does not really DESCRIBE what this pole or stake LOOKS like. All we know for sure from the Bible itself is that it was made of WOOD and that Jesus was NAILED to it. However, SOMETHING has led the entire church, INCLUDING the Jehovah's Witnesses themselves in the beginning of this denomination to believe that Jesus died on a CROSS. Perhaps it was the EYEWITNESSES, who gave the entire church and even the entire world the belief that Jesus died on a CROSS. I understand that many believers like to use the Bible ALONE to teach church doctrine. I myself feel the same way, but at times it is necessary to use church history to confirm and support what the Bible teaches. So before we take a look at any church history let us take a look at some verses in the Bible that suggest or indicate that Jesus was NAILED to a cross, or a cross beam of wood that was attached to an upright stake of pole that fits the SHAPE of the cross that nearly every church throughout the history of the church has always used as a SYMBOL of the death and resurrection of Jesus. So then, one arguments for defending the faith that has been handed down through the entire history of the church of Jesus being crucified on a CROSS is found in John 20:25 where Thomas is saying that he will not believe that Jesus is risen from the dead until he sees the print of the NAILS in his hands. Not just ONE single nail is being mentioned here, but rather the PLURAL use of NAILS is being used. This verse has led many Christians to believe that the PLURAL word “NAILS” means that the hands of Jesus must have been spread out to the side and thus a CROSS would be needed for Jesus to been nailed to using two nails rather than one nail. Most crucifixes used by Catholics show the feet of Jesus being nailed to the cross with one single nail and then each hand being nailed to the cross using one nail for each hand. Thus the PLURAL use of NAILS in John 20:25 to show that more than one nail was used to nail the hands of Jesus to the CROSS. Therefore many Christians argue that if so be that Jesus was crucified on a POLE or single STAKE, then only ONE nail would have been used to nail the hands of Jesus to the stake where one hand would be place over the other hand using the one single nail. Even the Jehovah's Witnesses use a picture of Jesus being nailed to a stake using ONE nail. 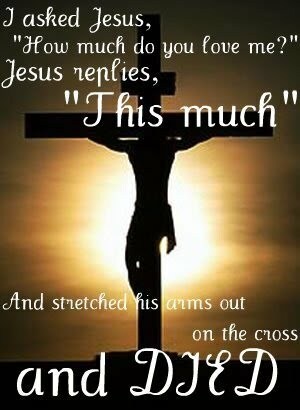 See image below and notice the ONE nail piercing both wrists or hands of Jesus. Now I personally do not see why just ONE nail had to be used to go through both hands at the same time. Yes the pictures and drawings used by the Jehovah's Witnesses themselves definitely show that hands of Jesus being crucified on a pole being overlapped with only ONE nail being used, but each hand COULD have been placed on either side of the pole directly across from each other and thus require TWO nails. If Jesus was hung on a pole in this manner then there would also have been room to hang the sign directly above the head of Jesus just as the scripture says, because the hands and arms of Jesus would have been more to the sides of the pole or stake and out of the way. Again I am not a Jehovah's Witness nor am I siding with the Jehovah's Witness teaching that Jesus must without fail have been crucified on a pole. I am merely considering ALL the evidence. And ALL the evidence has not been presented as yet so let us now take a look at the evidence presented by the Jehovah's Witnesses that the Christians in the first century did not teach that Jesus died on a CROSS and therefore the first century church did not use a cross in worship. Here is what the Jehovah's Witnesses teach. So then, what were the traditions that the early Christians in the first and second century held fast to and taught? But this particular verse sited as a PROOF text says NOTHING about whether of not Jesus was crucified on a stake or on a cross. NOR does this so called PROOF text tell us anything of WHAT the FIRST century Christians believed. But what it does tell us is that the BRETHREN were to stand FAST and hold to the TRADITIONS which they had been taught. So then, any EYEWITNESS testimony would most certainly PROVE the SHAPE of the instrument upon which Jesus was crucified. And TRADITION of SHAPE of the "STAUROS" upon which Jesus was crucified that has been handed down from generation to generation all through the entire history of the church has always been the SHAPE of a CROSS. In arguing against the Jehovah’s Witnesses’ teaching that Jesus died on a “torture stake” there are indeed some indirect clues in the New Testament that definitely point to Jesus being crucified on a CROSS and oppose to a torture stake.. We just looked at one of these clues in John 20:25 about the plural use of NAILS., which definitely suggest that Jesus hand were NOT overlapped together as the Jehovah's Witness in their depiction of Jesus being crucified on a torture stake in the above picture. Another piece of evidence is found in John chapter 21. “Jesus gives Peter a glimpse of the manner of his death: ‘When you are old you will stretch out your hands, and someone else will dress you and lead you where you do not want to go.’ Jesus said this to indicate the kind of death by which Peter would glorify God” (verses 18–19). The fact that Peter (who tradition says was crucified) would “stretch out” his hands indicates that Roman crucifixion usually involved outspread arms such as would be positioned on a crosspiece. So certainly with the arms of Jesus being STRETCHED OUT to either side would REQUIRE at least TWO nails and would then agree with John 20:25 having the PLURAL use of NAILS. Other arguments state that the historical evidence for Roman crucifixion was on many different shapes of objects usually made of wood. At times it was just a single upright pole. At other times it was an upright pole where a CROSS beam was attached. And yet at even other times people were crucified on a wooden structure in the shape of the letter “X” and at times on the shape of the letter “T” and all these different shaped went under the same name of being a "STAUROS", which the Jehovah's Witnesses CLAIM can ONLY be translated as a POLE, a STAKE, or a PALE. But yet HISTORY shows us that the SHAPE of the "STAUROS" had many shapes and was NOT just a single upright stake as the Jehovah's Witnesses INSIST. In other words, just because something is called a stake or a pole does not mean it is ALWAYS just a single, vertical shaft WITHOUT any cross member whatsoever. It can be, but it does not always dogmatically demand that it MUST be. For example, we refer to the thing that holds up power lines as a utility pole, even though it is usually fashioned with a CROSS member. Below is a picture of a telephone POLE even though it is in the SHAPE of a CROSS it is still yet CALLED a telephone POLE, or a utility POLE. You see dear child of God the definition of the Greek word “Stauros” does NOT state or demand that a single pole or a single upright stake must not have a cross member of any kind. When a person talks about a telephone POLE some people may see in their mind a single upright pole without any cross member whereas another person my visualize a pole with a cross member like the picture below. Both would be correct, because the general meaning of the word pole in any language does NOT demand that the pole be without any cross members whatsoever. I mean I have never heard any one call a utility POLE a utility CROSS, because it is UNDERSTOOD that a POLE can indeed have a cross member and still be called a pole. It should be noted that if Jesus were crucified on a stake as the Jehovah's Witnesses insist, then the sign would be placed directly above his hands, rather than his OVER or ABOVE his head as the word of TRUTH, the Holy Bible clearly STATES. Now some have argued that there is room for such a sign directly over the head of Jesus between his arms if Jesus was hung on a stake with his hands above his head as opposed to the arms of Jesus spread out to the side being crucified on a cross. However, when you read the account of the Gospel of Luke we read that this sign was is THREE languages, which would not be just a little tiny sign as some suggest. Please read Luke 23:38. In other words, the sign was placed above the head of Jesus fore the very PURPOSE to be SEEN and in order to fit a sign in three different languages to be SEEN, then this sign could NOT have been just a small sign in order to FIT between the arms of Jesus as some CLAIM. I mean why bother putting up a sign at all if it was to small to be SEEN. Also another piece of sound Biblical evidence can be seen in the wording of the writers of the gospel describing the two thieves or malefactors that were crucified on both sides of Jesus. The writer specifically states that one was crucified on the RIGHT HAND of Jesus and the other on the LEFT (where left HAND is implied in the context). Again please take note that the word of truth does not say to the right side and left side, but rather plainly states on the RIGHT HAND and on the LEFT, which definitely indicates that the arms of Jesus were outstretched to his RIGHT and his LEFT and NOT straight up over his head as the Jehovah's Witnesses insist. Still yet again we have another piece of evidence that indicates that Jesus was crucified with his arms OUTSTRETCHED to his right side and to his left side clearly showing that he was crucified on a CROSS, a “stauros” or pole with a cross member. History tells us that Peter was crucified on a CROSS and Jesus himself DESCRIBES the death that Peter should die as being with his arms OUTSTRETCHED. Please read John 21:18.19. “Verily, verily (or truly truly), I say unto you, When you were young, you girded yourself, and walked whither you would: but when you shall be old, you shall STRETCH FORTH you hands, and another shall gird you, and carry you whither you would not. This particular King James translation says stretch FORTH your hands, which can be INTERPRETED either way, as in, stretching forth one's hand directing above his head or stretching forth one's hands OUT to his RIGHT and OUT to his LEFT. So then, the LITERAL meaning when compare with the rest of God's word leaves no doubt that Jesus had to have been crucified on a pole WITH a CROSS member that nearly all translations have correctly translated as CROSS. Again in church history Peter's death is described as being LIKE the death of our Lord Jesus. Hence seeing the Jesus himself said that Peter's death would be with his hands OUT STRETCHED, then we can rightly conclude that the hands of Jesus were OUT STRETCHED as well. Please keep in mind that the EYEWITNESSES of the crucifixion of Jesus knew very well the SHAPE of the crucifix and the TRADITION handed down has ALWAYS been a CROSS upon which Jesus was crucified. "The budding faith Nero first made bloody in Rome. There Peter was girded by another, since he was bound to the CROSS". So the difference between the crucifixion of Jesus and that of Peter was Jesus was NAILED to the CROSS and Peter was BOUND or TIED to the CROSS. Some say that Peter was crucified on a cross upside down, but I myself have not found any sound evidence to support this claim. But we can be absolutely sure that Peter was crucified on a CROSS LIKE our Lord and savior Jesus Christ. Further historical evidence that shows that the Romans crucified criminals on a CROSS comes from a writer named Artemidorus who speaks of criminals being “crucified high and with hands OUTSTRETCHED” (Oneirocritica, I. 76. 35). Again the OUTSTRETCHED hands definitely indicate one being crucified on a CROSS with their hands outstretched to the right and to the left. Artemidorus confirms this by also saying, “the cross is made of pieces of wood and nails like a boat, whose mast is similar to a cross” (II. 53. 3)." Here is a picture of a boat with a MAST or POLE with a CROSS member to hold the sail OUTSTRETCHED to either side. A crag is a ledge that sticks OUT so the phrase "from crag to crag" DESCRIBES the cross as being rugged with a ledge that sticks OUT to both sides. Thus the hands of Jesus were OUTSTRETCHED to each side from one ledge to the other ledge. Lucian goes on to write expelling any doubt that the SHAPE of the “stauros” on which Jesus was crucified was without a doubt the SHAPE of a CROSS. Lucian describes the method of Roman crucifixion of that day using the Greek word “stauros”, but yet the hands were nailed SEPARATELY OUT to each SIDE just like ALL of church history has shown. So then, just as 2 Thessalonians 2:15 teaches us we are to STAND FAST and HOLD to the TRADITIONS which we were taught. Lucian writes even further describing the “STAUROS” as being LIKE the letter “T” or TAU in Greek, keeping in mind that the cross member was not all the way to the top in the case of Jesus. The Greek alphabet does not have any letter that is in the EXACT shape of the cross that the writer says LIKE the letter "T" much like another writer says that the "stauros" was SIMILAR to the mast of a boat with a CROSS member holding the sail OUTSTRETCHED to the sides. Surely the early Christians who did indeed KNOW the shape of the cross being EYEWITNESSES to it would have most assuredly used the Greek letter "l" or "IOTA" if the shape of the "stauros" had been a singl pole without and cross member. But history and tradition shows that they used the "T" or Greek letter "TAU" pronounced rhyming with "how". MORE early christian writers describe the cross upon which Jesus was crucified such as Barnabus, and Justin Martyr. Here is what Barnabus writes in his epistle or letter describing or comparing the cross of Jesus to Moses stretching OUT his arms as a type or shadow of the coming Messiah and how his arms would be OUT stretched to his sides. This is the same Barnabas spoken of in the book of Acts in the Bible so he was with the apostles of Jesus. Here is a picture from a Hollywood film where Moses is stretching out his hands to the RIGHT hand and to the LEFT. Now this is not to say that we should take all of what Hollywood depicts as the “Gospel” truth all the time, but here they have certainly portrayed the truth that agrees with the word of God with Moses illustrating the death of the Messiah with OUTSTRETCHED arms. Please read Exodus 17:12, which clearly states that the hands of Moses where outstretched OUT to each SIDE and NOT stretched forth directing over his head as the Jehovah's Witnesses insist. Here is a quote taken from a website that goes into great detail giving every HISTORICAL reference to support what actually took place at the crucifixions by the Romans. Then all through church history the crucifixion of Jesus has always been pictured and stated to be on a CROSS, which is indeed a POLE, but which also has a CROSS member. Even the founder of the Jehovah's Witnesses and the early Witnesses all believed and taught that Jesus died on a CROSS. It has only been a little over eighty years now that the Watch Tower Society BEGAN to changed their belief on this position of Jesus dying on a CROSS. Early on when they first started to change their belief the Watch Tower society explained that Jesus did not die on a cross, but rather Jesus was nailed to a TREE. Through the years this belief has evolved even further where Jehovah's Witnesses now insist that Jesus did NOT die on a cross, but rather died on a torture stake. It was not until around 1972 that the Jehovah's Witness began taking a FIRM dogmatic stand the Jesus did not die on a PAGAN cross, but rather on a torture stake. Here is summarized history of what the Jehovah's Witnesses taught in the past to what they teach now. The Jehovah’s Witnesses magazine shows the “Crucifixion” (with a picture of Christ on the Cross) CREATION, p. 265). “The Cross” (in a picture) in CREATION, p.336. There is also the Cross and crown logo, which was the symbol of Watchtower 1/1/1891, P. 1277. One needs to understand that Russell had no problem with this since there is evidence he was Mason, and this is Masonic symbol. It is no wonder he hated the cross. Jesus was depicted on a cross in the early years of President Rutherford as well (Harp of God p.113). In1928, Rutherford’s book Reconciliation picture Jesus along with the two thieves on crosses. The caption to this reads, … “The death of Jesus Christ upon the cross put an end to the law covenant” (Reconciliation, p.168). It seems that many of the early Witnesses of this organization would be considered apostates today because of their viewpoint, even their president. After Russell died, during Rutherford’s administration of the Watchtower beginning with its issue of October 15, 1931, began to change. In 1936 the Society began to change their position to what has become the current Watchtower Society position, that of His crucifixion on the torture stake. Rutherford wrote, “Jesus was crucified, not on a cross of wood, such as is exhibited in many images and pictures, and which images are made and exhibited by men; Jesus was crucified by nailing his body to a tree” (Riches p. 27). Hanging on a tree is Peter’s favorite description of Christ, Acts 5:30 “The God of our fathers raised up Jesus whom you murdered by hanging on a tree.” Acts 10:39 “whom they killed by hanging on a tree.” Acts 13:29 “Now when they had fulfilled all that was written concerning Him, they took Him down from the tree and laid Him in a tomb.”1 Peter 2:24 “who Himself bore our sins in His own body on the tree.” This does not infer that Jesus was literally hung on a tree instead of a pole or a cross. Peter uses this because cursed is anyone who is hung on a tree. He is using the Old Testament model to show Christ took our curse in our place, not that he hung on a literal tree. The Awake magazine of 1972 says “No biblical evidence even intimates that Jesus died on a cross.” (11/8/1972, p. 28). The evidence indicates that Jesus did not die on the traditional cross” (Awake 9/22/1974, p. 28). They even show a picture of Jesus with one nail through both hands (Awake 4/8/1974, p. 14). Now in all fairness in doing my best to just present the evidence I must add that simply because a church denomination CHANGES their position on what they belief and teach does NOT dogmatically demand that a church has departed from the truth. At times it can most certainly mean that their eyes have been opened to see the truth as to why they CHANGE what they believe and teach. And on the other hand it may be that they have been DECEIVED by the enemy THINKING that they have been revealed the truth as the reason they CHANGE what they teach. So the mere FACT that the Jehovah's Witnesses have CHANGED what they believe is not sound evidence to say that they are false teachers. Either way right or wrong this does NOT mean that ALL Jehovah's Witnesses are NOT saved, just because they do not agree with every teaching of the main stream “Orthodox” church. Please understand that I am NOT a Jehovah's Witness. I have never been a Jehovah's Witness, NOR will I EVER become a Jehovah's Witness, because I know that they have far too many errors in what they teach. However, I truly believe that many Jehovah's Witnesses are indeed true born again Christians that truly love God and who sincerely want to please him, but this does NOT mean that ALL the teaching of the Jehovah's Witnesses are SOUND BIBLICAL teachings. I personally know some Jehovah's Witnesses and they believe and confess that Jesus is the Son of God who die for their sins. This alone is the FOUNDATION of our faith and what releases us from the debt of all our past sins. So then to simply deny that the man made doctrine of the trinity because you do not agree that it is a SOUND BIBLICAL teaching does NOT make a Christian to no longer be a Christian as many “Orthodox” churches dogmatically demand calling every church denomination that does NOT AGREE with their teaching on the doctrine of the trinity CULTS. The true Biblical definition of a CULT would be to DENY that Jesus is the SON OF Almighty God the Father, who died for the sins of the whole world. Again I am NOT defending ANY teaching of the Watchtower Bible and Tract Society. In fact I have other studies that WARN people of the dangerous teachings of the Jehovah's Witnesses, but again this does NOT mean that absolutely NO Jehovah Witness is saved. Many Witnesses do indeed believe in Jesus who died for the sins and they love God with all their heart. And it is time that the main stream churches sees this FACT and take a closer look at some of their OWN man made doctrines. Despite the common belief among many Christians it is unlikely that Jesus carried the whole cross as depicted in church paintings, because according to Roman literary sources, those condemned to crucifixion did not carry the complete cross, but rather carried just the cross member called the pabulum. The upright pole remained in place and was used over and over, while one being crucified as part of his punishment was made to carry this cross member, which was then lift up and attached to the fixed upright pole to form a CROSS, but still yet was called a pole or a stake. Even common sense teaches us that the weight of an entire cross would be extremely difficult for a weight lifter to carry let alone someone who was beaten nearly to death before he was made to carry the cross. Just to recap on one point that I have already made that I believe all people can relate to in this day and time is the UTILITY POLE or TELEPHONE POLE. No one today would can DENY that a utility POLE is anything different than a utility POLE even though some utility poles do indeed HAVE CROSS members attached to them. We do not call a utility pole a UTILITY CROSS just because it has a CROSS MEMBER attached to it. NOR does anyone DENY that a utility pole has the SHAPE of a CROSS when there is indeed a CROSS member attached to it. So my point is WHAT did the EYEWITNESSES of Jesus SEE. This brings us to the FIRST century Christians, who were EYEWITNESSES of the SHAPE of the “STAUGOS” upon which Jesus was crucified. Now the Jehovah's Witnesses CLAIM that the FIRST century church did NOT use the SYMBOL of the CROSS and that the use of the PAGAN cross did not come to be used in the church until the time of Constantine in the third and fourth centuries. This is simply NOT a true statement. You have to understand that the FIRST century Christians were under HEAVY persecution on all sides and t be know as a Christians was almost certain death. Now while it is true that there is no OPEN use of the cross by Christians that has been preserved in history there is quite a bite of historical evidence of the symbol of the cross being HIDDEN in other symbols used by FIRST century Christians all the way to Constantine when the heavier persecution was ended for a duration of time. 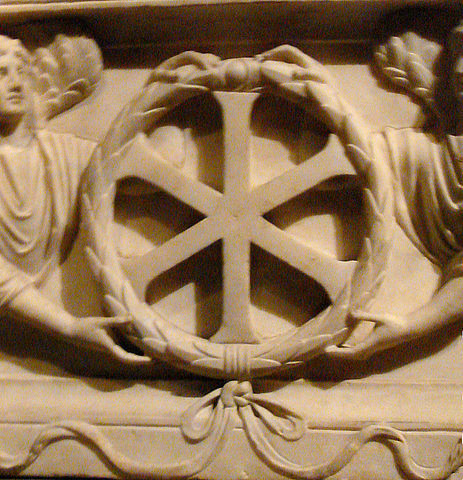 One of these earliest symbols used by Christians is called the “STAUROGRAM”, which contains the Greek word “STAUROS”. The “Staurogram”, also called the Tau-Rho, is a combination of the Greek letter “tau” or “T” combined with a Greek letter “rho” or “P”, which was indeed used in the early church as a SYMBOL for the Greek word for cross upon which Jesus was crucified. These Greek letters also had a deeper meaning among these early Christians. The letter “tau”, which looks like the capital ”T” in the English language as well symbolizes the cross on its own. However, no early evidence is found where any symbol of the cross on it's OWN was used by the first century Christians. But again there is indeed evidence of the symbol of the cross being used in COMBINATION with another symbol. So therefore the symbol of the cross was indeed used by these early Christians in a HIDDEN form of a combination of symbols were the cross could be see, but NOT mad blatantly obvious as to draw persecution to themselves. They would over lay the Greek letter “rho” over the Greek letter “tau” to create a HIDDEN symbol of the cross as shown in the picture below. The deeper meaning is said to be that the Greek letter “rho” has the numerical value of 100, which itself could either be a reference to the Greek word for help, which also had the numerical value of 100, or as a reference to Abraham himself, who was 100 years old when Isaac was born from whose loins the Messiah would come. It is also interesting to note that when Constantine had a vision of a cross of light in the sky that it was a very close resemblance to the “STAUROGRAM” or the “TAU-RHO” in the picture above. It is said that after Constantine saw this symbol of the staurogram that Jesus appeared to him in a dream and told Constantine to use this SYMBOL or SIGN in battle against his enemies. Now history tells us that Constantine did indeed use a form of the symbol of the staurogram as pictured below as Jesus instructed him to do. And history also tells us that Constantine was indeed victorious over his enemy. So YOU decide whether it was Jesus or Satan who appeared to Constantine as some CLAIM who are in opposition of Jesus dying on the cross. Keep in mind that faithful Christians who were being MARTYRED for their faith used this very same SYMBOL of the “STAUROGRAM”. Constantine did quite a bit to aid or help the Christians and was baptized as a Christians before his death. But before Constantine died he put this symbol of the cross on his coins with the cross piercing the serpent showing the POWER of the cross over Satan. So to ME, I would be a fool to make the claim that the vision Constantine saw of the “STAUROGRAM” was of SATAN. Why would Satan help Constantine win his battles against his enemies? Constantine was favorable to Christians. To me, if Satan was behind the vision, then Constantine would have LOST the battle against his enemies so he could not HELP Christians as history clearly shows us that he did indeed put a stop to the persecutions of Christians. And if it was Satan, then all I can say is STUPID Satan! In the Greek manuscripts the words “Alpha” and “Omega” were not spelled out like they are in the translations of the Bible, but where rather written as two Greek letters of the Greek alphabet. The Greek letter “Alpha” is the first letter of the Greek alphabet, and the Greek letter “Omega” is the last letter of the Greek alphabet. Thus the meaning of the beginning and the end being connected to Jesus. So these early Christians put these two Greek letters together to form the HIDDEN SYMBOL of the “STAUROS” upon which Jesus was crucified. 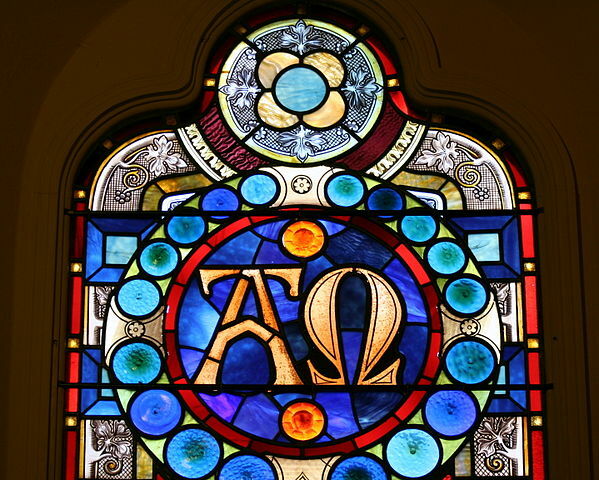 Please notice the CROSS MEMBER on top of the Greek letter “Alpha” in the picture below. This is NOT how the actual Greek letter “Alpha” is written. So it is a DEFINITE hidden symbol of the CROSS. Again the EYEWITNESSES of the crucifixion of Jesus most certainly knew the SHAPE of the “STAUROS” upon which Jesus was crucified and in the SYMBOLS they used to let others know that they were Christians in this time of heavy persecution in the FIRST century they often HID this SHAPE of the “STAUROS” in the SYMBOLS that they used to keep from drawing persecution to themselves. Another early Christian symbol of a “HIDDEN STAUROS” is an ANCHOR. 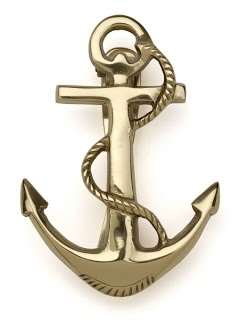 In the book of Hebrews we see that the ANCHOR was used as a sign of HOPE that we all have in Jesus Christ. The anchor is a symbol of safety in a storm. Again the early Christians used things that other Christians would KNOW, this is why there are no symbols of a single POLE representing the “STAUROS”, because no other Christian would recognize the symbol of a single pole in connection with Jesus. Now an ANCHOR has many SHAPES and yet the early FIRST century Christians use the ANCHOR in the following SHAPE pictured below. Again notice the HIDDEN STAUROS” drawn within the anchor to DISGUISE the SHAPE or the STAUROS, which was in the SHAPE of a CROSS upon which Jesus died to avoid drawing persecution to themselves. The anchor was often laid over on it's side as well to even be less obvious and at times a rope was drawn as well. The anchor was often laid over on it's side as well to even be less obvious and at times a rope was drawn as well. It has been said that Christians during the time of persecution but not necessarily the FIRST century, but rather during persecution throughout the church age they would draw an X in the dirt rather casually as if doodling to let other Christians know that they were Christians as well. Sort of a secret code so to speak. Well to me it is interesting to note that they never used a straight line like a single pole, but rather always used a symbol of CROSSED lines. And it also appears that they always used something in the Bible as well but in a HIDDEN way. So when these two Greek letters are put together, or combined, or overlaid one upon the other they form a SYMBOL that was used by the early Christians with HIDDEN meaning for the crucifixion of Jesus Christ. This “IX” symbol can be found as early as the FIRST century. Again please notice in the picture below two CROSSED lines crossing the first letter “I” of the name of Jesus signifying Jesus being nailed to the CROSS. Some may argue and INTERPRET this symbol the other way around and say the the "I" is the symbol for the cross and the "X", which stands for "Christ" was nailed to the "I" the "Iota" which represented the "stauros". But just like the Bible we must keep this in CONTEXT and COMPARE what we INTERPRET with the WHOLE picture. And the WHOLE picture of the church has ALWAYS been that Jesus was crucified on a CROSS. This brings us to the SYMBOL of the fish. The SYMBOL of the FISH was a very common SYMBOL with a HIDDEN meaning that was used by FIRST century Christians. Ichthys is the Greek word for fish. And again it was one of the most widely used SYMBOLS of Christian in the first century all the way through the history of the church. Even today Christians place this SYMBOL on their cars, windows in their homes and the jewelry they wear. The SYMBOL of the fish related to the many miracles of Jesus we read about in the Gospels. which means “Jesus Christ, Son of God, Savior.” But if these early first century Christians wrote out this phase anyone could easily read the phrase and know that they were Christians. Thus they HID the meaning of this phrase “Jesus Christ, Son of God, Savior as the Greek word “ICHTHYS” means FISH. Hence the SYMBOL of the FISH says it all. Now some research that I cam across said that because of the Roman persecution and you were not certain who you could trust that a believer would simply draw a single ARC in the dirt and if the one next to them would COMPLETE the SYMBOL of the FISH by drawing in the other ARC that CROSSED over the first arc to also represent the CROSS by the CROSSED lines, then they both knew that they were in good company and could speak freely. Below is a visual aid. So then, to make the CLAIM that the FIRST century Christians did not use the symbol of the cross is not entirely a true statement of FACT and could be misleading. Yes it is true that no OPEN symbol of the cross can be found in the first century, but again many HIDDEN SYMBOLS of the CROSS can indeed be found in history during the first century. Now the last argument used by the Jehovah's Witnesses in that God would not allow his Son to be crucified on a PAGAN CROSS. Well what about the PAGAN torture stake? You see dear child of God, the single upright POLE is also a PAGAN object used in PAGAN worship. So the logic behind this argument simply falls away, because the upright pole was a pagan object to their fertility goddess. Even in Christian times the phallus was represented by the pole SHAPED pagan object called an Obelisk, which was used by Pagan Egyptians, Romans Pagans, and the Hindu Lingam. Also PAGAN sacred poles are spoke of in the Bible as being IDOLS that were to be torn down and destroyed. Please read Exodus 34:13, which clearly DESCRIBES these PAGAN objects of worship as UPRIGHT pillars or POLES. "But their altars YOU people are to pull down, and their sacred pillars YOU are to shatter, and their sacred poles YOU are to cut down." So then, once again to use the argument that at a certain OBJECT is used by SOME in worship to false gods or in a way that goes against God's intended use, does NOT make the OBJECT or the SYMBOL of an object in and of itself to be evil. People today say the "guns" are evil, but a gun in an of itself can do NOTHING. Something as common and simple as a ROCK can be USED for evil, but this does NOT make the rock itself to be evil. You see if it were true that ALL things PAGAN are evil or any thing that is USED for evil is no longer fit to be used by Christians, then we could no longer go out side after a rain and ENJOY looking at a beautiful rainbow, because SOME people have taken the RAINBOW as THEIR SYMBOL to IDENTIFY to other homosexuals that they are homosexuals. According to this line of logic that once an object or symbol of an object is used for evil and it can no longer be used in a GOOD way, then it would be a SIN for anyone to ever have a CAT as a pet, because the Egyptians used to worship CATS. The Bible teaches us that what God has CLEANSED not to call unclean. Under the NEW covenant even the meat offered to IDOLS has been cleansed by God and by prayer and thanksgiving ALL kinds of meat is free to be eaten by Christians because God has cleansed all things and by faith it is sanctified. Most all Christians know this but some groups of Christians are deceiving and seducing the brethren to be brought back under ALL the law of Moses. These Sabbath keeping groups are still yet Christians, but they have been deceived in some areas such as being misled to wrongly believe that all the dietary laws of the Old Testament must without fail be obeyed. This is NOT what the NEW Testament teaches us. Please read 1 Corinthians 8:1-9, which clearly teaches us that an IDOL is NOTHING if it is NOT worshiped as a false god. And no true Christians worships the CROSS as a false god. In truth no true Christian worships the cross at all, but rather uses the cross as a symbol of their faith. “Now as touching things offered unto idols, we know that we all have knowledge. Knowledge puffs up, but charity edifies. 2. And if any man think that he knows any thing, he knows nothing yet as he ought to know. 8. BUT meat commends us NOT to God: for NEITHER, if WE eat, are we the BETTER; NEITHER, if we eat not, are we the WORSE. Paul continues this teaching of Jesus on Christians eating meat, ANY KIND of meat in 1 Corinthians chapter 10. God told Peter in a vision of all kinds of animals that were ONCE unclean animals under the OLD covenant to slay and EAT. Peter said not so Lord, because he had not yet learned that God had CLEANSED all things. You see, the church was still yet LEARNING. Thus the reason for the VISIONS and the teaching of the Holy Spirit. Paul had so many visions that he feared of being puffed up with knowledge. Thus his bold statement of Paul saying, "If you THINK you know anything you know nothing as you OUGHT To know". Here is what Paul goes on to teach us about the LIBERTY we have to EVEN eat meat offer to IDOLS KNOWING full well that it was offered to idols. WOW! That is LIBERTY! BUT we should not use our liberty if it is causing a brother in the Lord who is weak in faith to fall away from God. Please read 1 Corinthians 10:25-31. 29. Conscience, I say, NOT YOUR OWN, BUT of the OTHER: for why is my (or OUR) liberty judged of another man's conscience? 30. For if I by grace be a PARTAKER (speaking of being a partaker of eating ANY KIND of meat WHATSOEVER, even meat that has been offered to IDOLS), why am I evil spoken of for that for which I give thanks? Can you not see my dear brothers and sisters in our Lord Jesus Christ, that God has CLEANSE all THINGS and that an IDOL is NOTHING so long as YOU yourself are not using it in worship to a FALSE God. YOU know your heart and God knows your heart so do NOT be brought under condemnation by another MAN's belief. Follow what the HOLY SPIRIT is leading you to do and not to do. Read God's word for YOURSELF and study to show yourself approved rightly dividing the word of God. Now I personally do not have any CRUCIFIXES with Jesus still on the cross, but I have no problem with having a SYMBOL of a cross in my home, because I know to what it symbolizes. I personally do not think anyone truly knows what Jesus looks like, nor the shape of Almighty God, so any image, in my own opinion, should not be attempted. But as for the SHAPE of the “STAUROS” upon which Jesus was crucified I believe all the evidence makes it more than clear that it was the SHAPE of a CROSS. So any symbol of a simple plain bare cross, to ME, is perfectly acceptable it the eyes of God. Now back to the idol being NOTHING. For US as Christians it is NOTHING, but for others who have NOT the knowledge of Jesus Christ their idol worship is towards a FALSE god. So while a Christian is FREE to have any idol in their home, I personally would NOT, because those who do not know our LIBERTY in Jesus Christ, will no doubt get the WRONG idea that worshiping FALSE gods is perfectly alright in the eyes of the one true God. So if you visit a fellow Christian who believes that it is a sin to drink coffee and you KNOW this, then do NOT bring a thermos of coffee when you come to their home. God will open their eyes about the LIBERTY they Have in Jesus Christ when they are ready to receive this truth. Now when it comes CATS that were worship by Pagans directly as being gods themselves, then I am not sure that anyone should have a CAT as a pet. Just kidding! Lighten up! This whole argument over whether or not Jesus died on a cross is from the enemy who is DECEIVING Christians to be DIVIDED against each other. This particular controversial issue on the cross is NOT a matter of salvation, so what we believe on this issue does NOT make one to be saved and another lost, but for the sake of truth for truth's sake all areas of controversy should be examined closely so that we all come to the UNITY of the faith. Now if the Watchtower Society and their Jehovah's Witness followers, who are taught to only follow the teachings of the Watchtower Bible and Tract Society take offense at the Christians SYMBOL of the cross as being a PAGAN object of worship based on the fact that it was a PAGAN object of worship, then I say to the Watchtower Society and all Jehovah's Witnesses who feel the same way, that THEY should take a CLOSER look at their OWN use of PAGAN symbols in their OWN organization! This image or SYMBOL of a TOWER is a PAGAN symbol, so according to your OWN reasoning you may be SINNING by using this PAGAN symbol for your church organization. Now some apologist of the Watchtower Society argue to defend their use of the PAGAN symbol of the TOWER by saying that it was an object used as a symbol by God in the Bible BEFORE it ever was used by PAGANS. Well this may be true, BUT the use of the symbol of the TOWER BY the Watchtower Society itself came LONG AFTER the PAGANS took the TOWER into their worship. I fully realize that the Bible itself speaks of our God and being a STRONG TOWER and that the sincere intent of Jehovah's Witnesses themselves, who are UNAWARE of the intent of the founding father of the Watchtower Society and why HE chose the TOWER symbol, do NOT themselves worship a PAGAN god. But NEITHER is it the sincere intent of any Christian, who uses a CROSS as a symbol of their faith pointing to Jesus, to worship a PAGAN God either. All I am saying is that the FOUNDERS of the Watchtower Society had DIFFERENT intentions of why they chose the TOWER as their symbol. But before we get into the history of Charles Taze Russell I want to point out that giving glory to a man made organization is NOT glorifying God. So then there is a matter of the jewelry, neck-less or identification tags that Watchtower organization uses to let others know you are a Jehovah's Witness and that you refuse any blood transfusions, and that the Watchtower Society is the HEAD of the church. My first question is what is the DIFFERENCE between a Christian wearing a symbol that ALL the world knows speaks of Jesus dying on the cross to the GLORY of Almighty God the Father and Watchtower symbol pointing towards the Watchtower ORGANIZATION? For me personally I would much more rather glorify Almighty God by remembering the death and resurrection of his Son Jesus Christ than I would to lift up a MAN MADE organization before the world. Jesus said you must take care of the MOTE that is in your OWN eye, before you will be able to see to take the mote out of another person's eye. It is true that the Watchtower is changing the use of PAGAN symbols and they are to be commended for this. BUT is this just a smoke screen to try and keep their SLAVES from leaving? So what the Watchtower Society portrays itself to be on the OUTSIDE does not change what they TEACH and how the Watchtower Society "lords" over their recruits shunning any Jehovah's Witness who QUESTIONS their authority. Again I commend the Watchtower Society for changing their logo on their books. Below the older books of the Watchtower Society proudly displayed the PAGAN Egyptian winged disc. It is no accident that this PAGAN symbol was placed on the Watchtower Bible and Tract Society that has NOTHING whatsoever to do with Almighty God or his word. It was no accident, BECAUSE the founder of the Watchtower society was a Mason. Here is an image of the Egyptian winged sun disc. Charles Taze Russell was a Freemason. It has been recorded in his own material and by his admittance as being a Freemason. The only way for any organization of this size to truly CHANGE is to forsake it all, the NAME of the organization, cut all ties with the Freemasons, get rid of any and all logos that would even hint that this organization ever was associated with the Watchtower Society, and start over. But obviously there is too much money to loose in doing something so drastic. And even future funds from the Mason would be lost as well. And then if it was man known to all Jehovah's Witnesses about the things kept secret, then ALL trust would be lost and the entire ORGANIZATION would collapse. And certainly none of the leaders of the organization would want this to happen. It would somewhat like the Roman Catholic church announcing to the world that they will no longer be teaching the doctrine of the trinity. The PRIDE would keep any such announcement of every happening unless God miraculously intervened. My point is NOT to do away with all symbols in every church denomination, but rather to show all Christians that the CROSS has ALWAYS been the SYMBOL of our Lord and saviors death and resurrection. The CROSS has ALWAYS pointed people to Jesus from the time of the crucifixion of Jesus to this present day. and there is NOT ONE Christians who uses the cross to worship a FALSE PAGAN god any more than any Jehovah's Witnesses uses the SYMBOL of the TOWER to worship a FALSE PAGAN god. There is one more point that I would like to make and that is on the POWER of the gospel speaking of God CONFIRMING his word with SIGNS following. Now some may be wondering what does preaching the WORD of God have to do with the CROSS. Paul said that he did not come with excellency of speech but with the POWER of God meaning that his teaching was backed up by Almighty God himself with works of healing and miracles. So then what image, symbol or sign was used by the early Christians to drive away devils and evil spirit that were possessing people? Did they use the SIGN of the STAKE being a single upright pole with NO cross members? NO! They did NOT! "At every forward step and movement, at every going in and out, when we put on our our clothes and shoes, when we bathe, when we sit at table, when we light the lamps, on couch, on seat, in all the ordinary actions of daily life, we trace upon the forehead the SIGN." (The Chaplet/De Corona 3.4). Early Christians did NOT make the sign of the STAKE on their foreheads, but rather they used the sign of the CROSS because the EYEWITNESSES of the crucifixion did indeed know the SHAPE of the “STAUROUS” upon which Jesus was crucified and they handed down this TRUTH that has remained UNQUESTIONED until just some eighty years ago by ONE man, who was a Mason, Charles Taze Russell. So if any church should be examined for MIXING Paganism with Christianity, then the question arises are Free Masons any less Pagan? The founder of the Jehovah's Witnesses was a Freemason. Again Charles Taze Russell was a Freemason. It has been recorded in his own material and by his admittance as being a Freemason. Russell was buried with a pyramid site marker or headstone, which has Masonic symbols engraved upon it. Below is a picture of this “Masonic” symbol of a cross and a crown. Now while this symbol may SEEM to be Christians it was NOT designed by the Jehovah's Witnesses or the Watchtower Society, but rather it was adopted first by the Freemason. Below are three photos of the grave marker of Charles Taze Russell the founder of the Watchtower Bible and Tract Society which CONTROLS what Jehovah's Witnesses read. And behind this PYRAMID memorial is the headquarters of the Freemasons. It is all one connected piece of property owned by the Masons. It is this CONTROL "lording" OVER, the deeds of the Nicolaitans that Jesus hates. Please read Revelation 2:6 where Jesus is speaking to the church of Ephesus. "But this you have, that you hate the deeds of the Nicolaitans, which I also hate." So then, what is the deeds of the Nicolaitans? The name "Nicolaitans" is translated from the Greek word "nikolaos", which is a compound of the two Greek words "nikos" and "laos". The Greek word "nikos" means to CONQUER or to SUBDUE. And the Greek word "laos" means "the people". This Greek word "laos" is also where we get the word "laity". Then when these two words are compounded into one, they form the name Nicolaitans, which literally means those who conquer of subdue the people. Thus the Nicolaitans were conquering and subduing the people or the LAITY. "But this you are having that you are hating the act of CONQUER-PEOPLES which also I am hating." Now on the outside looking in it is blatantly obvious that the Watchtower Society is LORDING OVER it people, which our Lord Jesus Christ HATES. The Bible clearly teaches us that we are NOT to LORD OVER the flock. 4. And when the chief Shepherd shall appear, you shall receive a crown of glory that fades not away." In closing I want to assure my dear brothers and sisters, who are Jehovah's Witnesses the the point of this study is to share the LOVE that God has ALL of mankind. For God so LOVED the WORLD that he gave his only begotten Son so the WHOSOEVER BELIEVES on him should not perish, but have eternal life. PLEASE, please do NOT misunderstand what I am saying my dear brothers and sisters within the Jehovah's Witness organization in this study in God's precious word. I am NOT JUDGING you and dogmatically demanding that you stop using any and all symbols connected with worshiping the one true and only Almighty God the Father and his Son Jesus, but rather I am saying to STOP JUDGING your fellow brothers and sisters in OUR Lord Jesus the CHRIST for having symbols of the SAME testimony of our faith that Jesus is the SON OF Almighty God the Father who died for OUR sins, and NOT ONLY for our sins, but ALSO for the sins of the WHOLE world, so that WHOSOEVER BELIEVES shall be saved. Let their be UNITY and LOVE among the BRETHREN, for how shall we love the world if we cannot love our own brothers and sisters in OUR Lord Jesus Christ. A dear brother OR sister in the Lord has been quoted as asking the Lord how how he LOVES us” Below is that quote from this unknown believer. I put you in REMEMBRANCE of Almighty God himself who makes it blatantly clear that if was SAY the we love God and love NOT our brothers and sisters in the Lord that God is NOT in us! “ YOU are of God, little children, and have overcome them: because greater is he that is in you, than he that is in the world. 21. And this COMMANDMENT have we from him, That he who loves God LOVE his brother ALSO. If you are thinking about becoming a Jehovah's Witnesses I implore you to do your OWN research to hear ALL sides, because once your are in it is NO easy task to get OUT! Please take a CLOSE look at what EX Jehovah's Witnesses have to say EXPOSING what the Watchtower keeps HIDDEN until it is too late. Here is a link that speaks the truth without hatred in his words toward the Watchtower organization or the Jehovah's witnesses. While I do not agree with all his beliefs I do see his love for people NOT to be deceived by the Watchtower Society. I have talked with a lot of ex Jehovah's Witnesses and they all say the same thing, It was easy to join, but there is a STEEP price to pay if you want out, SIMPLY because you no longer believe what the Watchtower Bible and Tract Society teaches. To me personally this is the sign of a cult that LORDS OVER the people which our Lord Jesus Christ HATES.